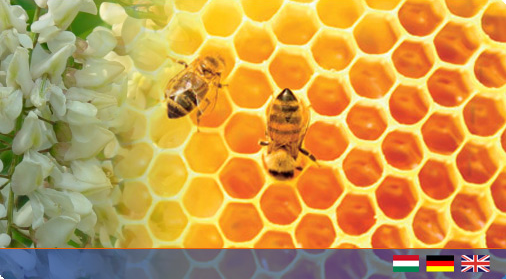 The ancient Greeks belived that honey originated from celestial dew. Today it is wel-know that honey is made from floral nectar by honey bees which collect, transform and thicken the nectar. The properties of honey are essentially determined by the plant producing the nectar.Pure varietals can only come from plants which bllom in large quantities at the same time and at the same place. Honey bees collect the sweet nectar in their „honeybag” and return to the beehive when it is full.The youn workers inside the beehive collect and move the nectar from beewax comb a few times.The enzymes produced in this process transform the complex sugar into simple fructose and glucose, which can be best utilised by the human body. In the meantime, the bees flutter their wings to reduce the water content of the nectar to 18-19%.Cells which have been filled are then sealed using wax.When most cells of the wax comb have ben filled, the beekeeper can harvest the honey. Honey is much more than just sweet stuff! Its benefits in the preservation and improvement of health – also used in apitherapy – are based on its physical and chemical properties.Honey has various nutritional benefits and privides the human body with a range of ecessary substances.With its diverse mineral content, honey can help establish a desirable balance of these minerals in the human body by providing the missing quantities.